The Framework for Improving Critical Infrastructure Cybersecurity (aka the NIST Cybersecurity Framework, aka the NIST CSF) offers security organizations a framework to build, manage, and measure their cybersecurity programs. However, when reading the document, it can feel like the actual framework is a secret—much like Dr. Strangelove’s doomsday device. I don’t actually believe the framework is a secret, but there is a certain level of decoding that organizations need to do to understand how to apply the CSF. But before I dig into how, let’s look at why the NIST CSF is even worth decoding in the first place. After all, your time is finite. Is it worth the effort to understand the CSF as a framework for your cybersecurity program? We think that it is. As we’ve written previously, the NIST CSF can help security professionals overcome the three hurdles of security maturity reporting. These are: building a shared language with executives and the board of directors, facilitating complex cybersecurity conversations, and mapping cybersecurity assessment findings to cybersecurity roadmaps. It’s critical that security organizations overcome these challenges because boards and executives are becoming increasingly interested in cybersecurity planning and strategy. Once you have the Board’s attention, you need to present a cybersecurity assessment they’ll actually care about. That’s where the NIST CSF fits in. The Functions and Categories are generally a grouping methodology. The Subcategories are described by NIST as “specific outcomes of technical and/or management activities.” It is excellent to know what outcomes an organization should look for from a cybersecurity program. However, if the desired outcome for a Subcategory is not being achieved, what activities should an organization start to perform or enhance to achieve that outcome? This information isn’t spelled out in the NIST CSF document. You need to dig into the Informative References. The Informative References section includes references to a number of standards, guidelines, and practices, including the Center for Internet Security Critical Security Controls, COBIT, ISO 27001, and NIST SP 800-53. These resources are great tools that organizations can use while determining the cybersecurity controls and activities that will be the most beneficial to the organization’s cybersecurity posture. For example, NIST SP 800-53 contains over 700 cybersecurity controls and control enhancements that can be leveraged to meet the outcomes included in the NIST CSF Subcategories. That alone can be overwhelming—if you go it alone. In order to assist organizations, build, manage, and measure their cybersecurity programs with the NIST CSF, we have created the NIST CSF Edition on the Axio360 platform. The Axio360 platform enables organizations to evaluate their cybersecurity programs using the NIST CSF (as well as the Cybersecurity Capability Maturity Model (C2M2)). The NIST CSF Edition of the Axio360 platform contains direct linkage to the NIST SP 800-53 controls that correlate with the NIST CSF Subcategories, which allows users to quickly and easily dive deeper into areas and controls where additional information is required. Users are then able to use the Axio360 platform to create Action Items and Targets to which the organization can manage. These resources on the Axio360 platform ensure that organizations are driving towards cybersecurity industry best practices and have the means to measure themselves against targets they can set for themselves. By providing a framework for assessing and communicating the organization’s cybersecurity posture, the NIST CSF accomplishes several very important objectives. However, there is a gap when organizations look for guidance on shoring up their weaknesses. This is where the Axio360 platform comes into play. And we’d love to show you how. A key challenge for cybersecurity professionals is communicating their organization’s cybersecurity successes and challenges to senior leadership, each of whom is likely to have varying degrees of technical understanding. However, finding a shared language—one that strikes a balance between ambiguity and complexity—is critical to an organization’s ability to form a unified understanding of its security maturity. Communicating without a shared language can result in frustration or, worst, a misrepresentation or misunderstanding of a critical cybersecurity challenge. In this blog post I’ll discuss how the NIST Cybersecurity Framework’s (CSF) Framework Core can help you overcome the three hurdles of security maturity reporting. I’ll also demonstrate how the Axio360 Dashboard leverages the Framework Core to generate board-ready information graphics that enable cyber risk and security professionals to clearly communicate the security maturity of an organization. The first hurdle on our way to effective security maturity reporting is finding a shared language that enables unambiguous communication to technical and non-technical executives and board members. Thankfully, the CSF Framework Core1 offers a solution for framing these nuanced cybersecurity conversations. Develop an organizational understanding to manage cybersecurity risk to the systems, people, assets, data, and capabilities. Develop and implement appropriate safeguards to ensure delivery of critical services. Develop and implement appropriate activities to identify the occurrence of a cybersecurity event. Develop and implement appropriate activities to take action regarding a detected cybersecurity incident. As you can see, the CSF Framework Core Functions are commonly understood verbs, and each has a clear call to action associated with it. Thus, the Functions can set the stage for operative-level communications. Security professionals can align the organization’s security maturity roadmaps, metrics, programs, and initiatives with each of the five Functions. In Hurdle #3 we will discuss how Axio360 natively supports the CSF Functions in both the CSF and C2M2 (DOE Cybersecurity Capability Maturity Model) Dashboards. The second hurdle on our way to effective security maturity reporting is distilling complex, often multi-threaded, cybersecurity projects and initiatives. Having established the CSF Framework Core as our common language, we can begin to communicate the successes and challenges of our cybersecurity programs through their respective Functions. A sampling of topics by CSF Function can be found in the below table. As you can see, framing a cybersecurity discussion within the context of the CSF Functions provides context and clarity for every member of the board regardless of their technical knowledge. The third, and probably most important, communication hurdle is having the ability to correlate recent cybersecurity assessment findings to security investment requests. No amount of improvement in the communication of what or how of our cybersecurity program will compensate for our inability to communicate the why: Why a security investment is needed; why a project is on the roadmap; why one project requires priority over another. CSF Functions are natively integrated into the Axio360 dashboard, so no matter if you are performing a CSF or C2M2 assessment, you have the ability to talk about the organization’s security maturity directly through the language of CSF. Axio360 allows you to communicate workstreams, target profiles, mitigation projects, and security investments using the CSF Functions. 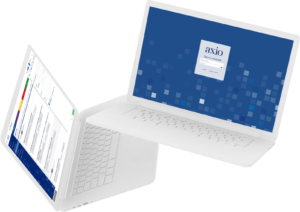 Even better: The Axio360 platform does the work for you—correlating your organization’s security maturity roadmaps, metrics, programs, and initiatives, with each of the five Functions. This has the power to transform how you communicate to senior leadership. Using Axio360’s native integration with the CSF Functions, you now communicate a unified understanding of your organization’s cybersecurity posture. NIST. (2018). Framework for Improving Critical Infrastructure Cybersecurity Ver.1.1. National Institute of Standards and Technology.